It’s nearly time to marry the love of your life. The wedding cake has been chosen, baked, and frosted, the vendors have been decided, the dress looks stunning, and you couldn’t be happier with your wedding venue in Colorado (this we guarantee). It’s taken you months, possibly even years, planning this day and the time has finally arrived! There are just a couple things left to get done before you stand at the altar and say “I do”, including the rehearsal. The wedding rehearsal is necessary to ensure that everyone knows what their roles are during the ceremony and that there isn’t any avoidable confusion during the proceedings. While many decide to have their rehearsal the day before, here at Church Ranch Event Center, we highly recommend having it the day of your wedding. There are many benefits with doing it this way (including the fact that we’ll be providing you with a professional event coordinator the day-of) that we’ll be discussing in this post. If you’re still searching high and low for your ideal wedding venue, you’ve found it! Contact us today to learn more about our event center or to book a tour of our gorgeous premises. One of the issues that arise when you have your rehearsal the night or day before your wedding, is that people tend to forget small details (especially if some of your wedding party enjoys a glass of bubbly or two to celebrate the occasion). While it’s unlikely that one of the attendants will stand in the groom’s spot or another major blunder, but the small details are important to remember for your special day. That’s why having it the day of your wedding will ensure that everyone is able to retain the information, and the ceremony will go on without a hitch. To take it a step further, having your rehearsal the same day will mean that everyone is in what we call “wedding mode”. The day before the wedding usually has all of your guests meeting and greeting, exploring the area, and the like. This will make it difficult for them to break away and focus on the rehearsal. The day of, everyone is fully prepared for the ceremony, meaning they will be paying complete attention to the proceedings and will be completely ready for the wedding when the time comes. Especially if you have guests coming in from out of town, it’s a lot to ask of them to get unpacked, get to know the area, meet some of the guests, and go through the rehearsal. By having it the morning or afternoon of the wedding, the night before will be the perfect amount of time for everyone to get settled, chat a little bit, and celebrate the upcoming event. 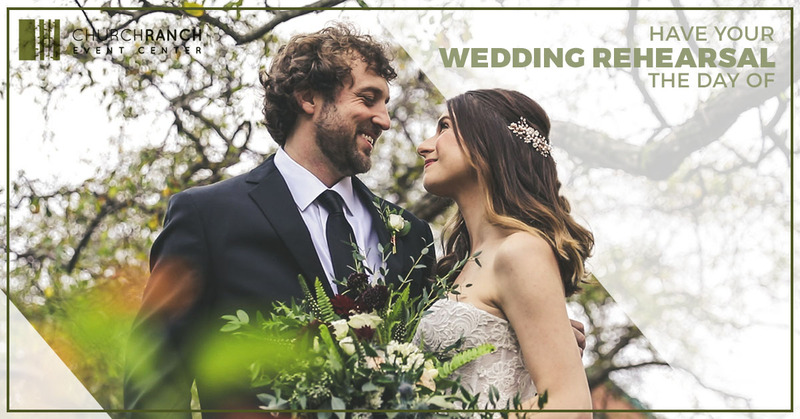 We know that there is a lot of stress involved with planning your wedding, but at Church Ranch Event Center, we make sure to help you every step of the way. If you have any questions or would like to schedule a time to come out and tour our Colorado wedding venue, feel free to contact us now!